Fold your sheet of paper horizontally, vertically and diagonally. Then open the paper. Fold one of the corner to the middle of the sheet of paper (marked thanks to your folding). 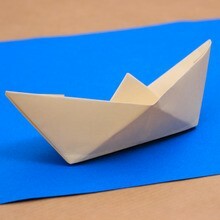 Turn over the paper and put the folded corner at the bottom left. Now, fold the left side and the right side of the sheet of paper along the vertical central line. Fold the top and the bottom of the sheet of paper along the horizontal central line and unfold them. Join the right side of the shape to the lowest horizontal line and unfold. Do the same to the left side. Join it to the lowest horizontal fold and unfold. Use the small diagonals at the top to pull the paper towards you and to put the top of the piece of paper along the central horizontal line. 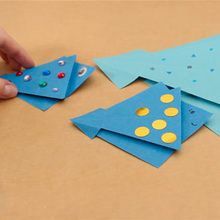 Now, you should have two small triangles on each sides of the shape. Lift these two triangles to the top of the shape. Pull the bottom right corner to the right, joining the bottom of the sheet of paper to the central horizontal line. Fold the top right triangle along the right diagonal. Turn over the origami and there is your fish! You can now decorate it as you want! 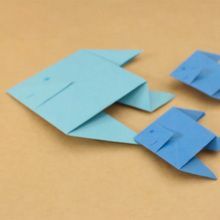 You can make this origami fish for April Fool's day. Stick it on the back of your friends for a funny but harmlous joke!